Friday 19th April (Good Friday) : Choir to perform at 3.00 pm in St. John's Church Ballinteer. Sunday 28th April : Choir to perform at "All in the April Evening" concert in Kilmacud Church at 8.00 pm. Sunday 19th May 2019 : Choir to compete in the New Ross Choral Festival. 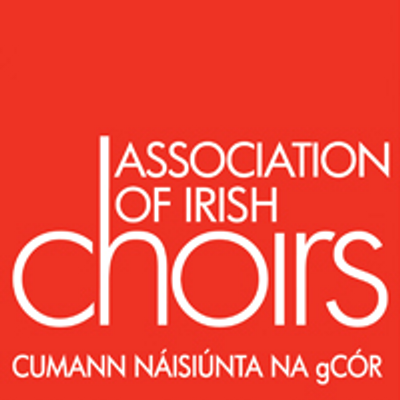 Saturday 8th June 2019: Choir to perform at the Farmer's Market in Marley Park between 11.00 am and 12.00 noon. The above article appeared in October 2018 Singing in a choir is one of the best feelings to experience, a great way to relax and socialise, good for your health, and recommended for your mental health. You even get to go on tour sometimes. Almost 20 years ago, in 1994, a group of men in Ballinteer decided to form a choir, rehearse weekly, and see where it took them. Well, it's certainly taken them to festivals abroad, e.g. Brittany in 2007, Chatte in the Rhone-Alpes region of south East France near Grenoble in 2009, and Cornwall in 2011, where gigs included the Eden Project (enjoying the wonderful acoustic of the Mediterranean Biome), and the Lost Gardens of Heligan. Not content with touring, the choir recorded a CD and launched its own international festival in 2008, which was held again in 2010 and will take place for the third time in May this year, with visiting choirs from Florence in Italy, Angers in France, and the youthful Baldonnel Male Voice Choir, with Air Corps connections, of course. On Friday 24th May, Naoise O Muirí, Lord Mayor of Dublin hosted a reception for the French and Italian choirs in the Mansion House. On Saturday 25th May, the choirs entertained at the Farmers Market in Marlay Park, ahead of the gala concert that evening in St John the Evangelist Church, Ballinteer. Coro La Martinella from Florence are an outstanding choir that the choir holds in high regard since hearing them at a choral festival in France in 2009. 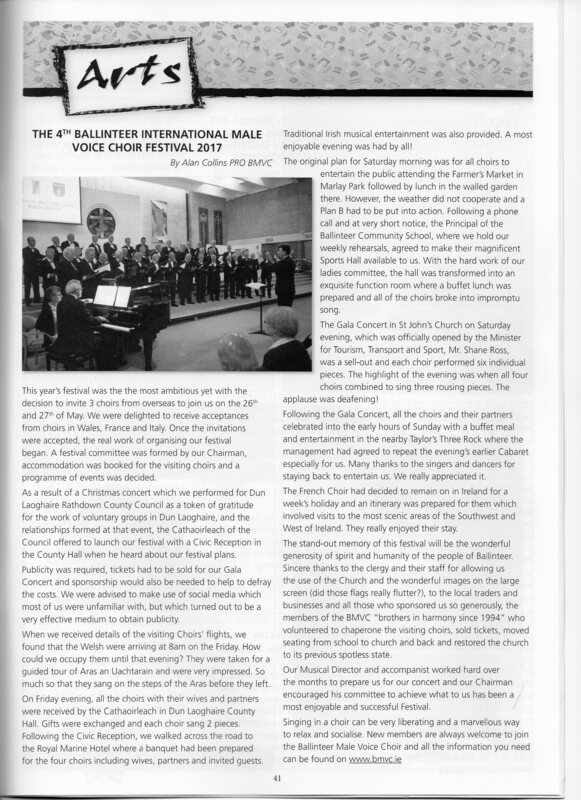 Previous French choirs visiting Ballinteer have always had the wow factor and the Ballinteer Male Voice Choir (BMVC) eagerly awaited the men from Anjou, near Brittany. The Baldonnel boys were table toppers (literally) at the last post festival party, reprising Queen's Bohemian Rhapsody. The post concert parties are the best kept choir secret, when the choirs socialise, eat, drink and sing into the small hours, taking it in turns to out-sing each other. 2012 was a remarkably busy year. 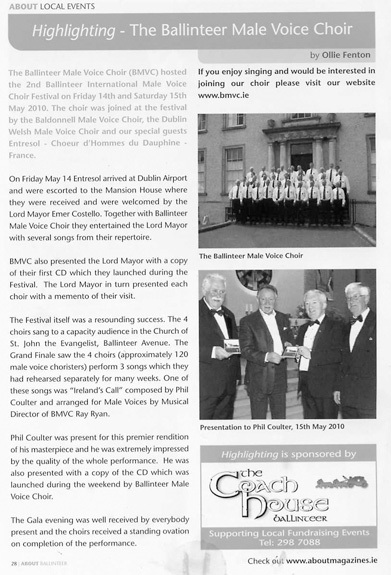 BMVC won the Navan male voice choir trophy for the third time, performed with the Stedfast Brass Band during the Dundrum Festival and in a Musical Risotto with Il Coro Italiano di Dublino in the Freemasons Hall in Molesworth Street. We performed for the first time in Grange Golf Club, the Mill Theatre, Dundrum and the magnificent Farmleigh House. We also took part in a number of fundraisers, in Ballinteer church for Our Lady's Girls school music fund, in the Mansion House for clinical cancer research (organised by John Crown), and in Holy Rosary church, Greystones for a life-changing operation for Leo, who suffers from celebral palsy, joining other choirs singing the Hallelujah Chorus under the baton of Leo's mother Julia Carrick. Having enjoyed a wonderful evening's entertainment in St John's GAA club with a Danish choir, Mandskoret Sonderborg in September 2011, the choir performed in October 2012 with a Finnish choir, Coro Finlandia in the Mill Theatre, and afterwards both choirs raised the rafters in the GAA club. One of the Finns performed on tin whistle with the local Comhaltas musicians. His Irish traditional-music collection runs into hundreds. Continuing the Scandinavian theme, a Norwegian choir, Dove, visited Ballinteer in July 2012 in its centenary year. The Danes have extended an invitation to visit Sonderborg. BMVC has a proud tradition of singing in local nursing homes at Christmas, Marlay Nursing Home, Simpsons Hospital and the San Remo Nursing Home in Bray. The choir was delighted to discover that one of the Simpsons residents is an ex member of the Pallestrina choir, as is its own Musical Director (MD), Mr Ray Ryan, who has been MD of BMVC since 2006. Ray studied piano, clarinet and singing in the College of Music, won the tenor solo in the Feis Ceoil and the Percy French trophy in the Arklow Feis. The choir's musical accompanist is Mr Graham Walsh who teaches music at Kings Hospital, accompanying the school choir in a recent final of the All-Island School Choirs competition in Belfast. Graham enjoyed accompanying BMVC on the grand piano in Farmleigh this Christmas, and was thrilled to play a Willis organ in Truro Cathedral, Cornwall, when the choir toured there. BMVC is rooted in the Ballinteer community and parish. Anchor events include singing at Easter and Christmas in St John The Evangelist church, including an Advent Carol Service with the 80 strong Gospel Choir, and Our Lady's Schools' Choirs. One of BMVC's members, Noel Ryan, was one of eight men ordained to the Permanent Diaconate in the Pro Cathedral in June 2012 and the choir was delighted to sing at Noel’s first Mass as Deacon. BMVC has a small number of vacancies for 1st tenors and baritones, and welcomes enquiries for membership. It currently has 37 members and rehearses weekly on Thursdays in Our Lady's Boys School in Ballinteer, and in Ballinteer St. Johns GAA Club on the last Thusday of each month. BMVC welcomes enquiries to sing on special occasions, e.g. 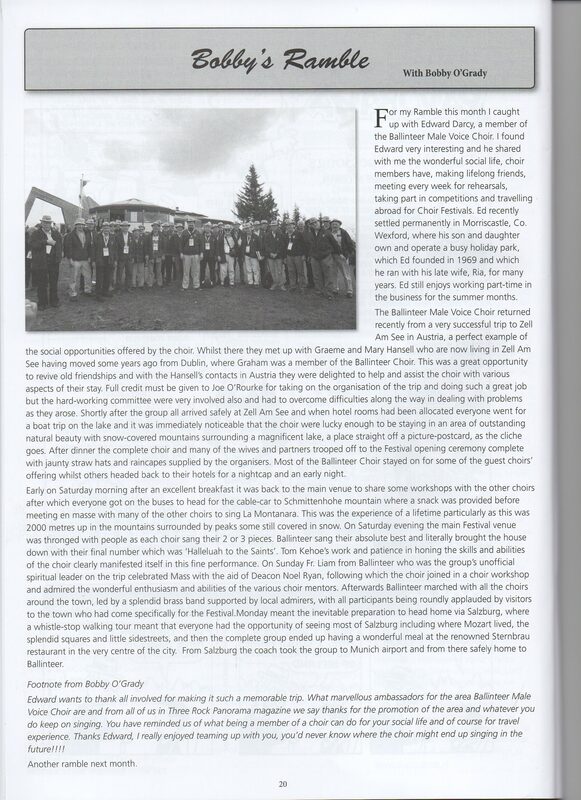 it performed at the Memorial Service for the late Katie French in St Patrick's church, Enniskerry in December 2007. The choir can be contacted via its website, www.bmvc.ie. If you hurry, new members might just get to sing in the Festival in May. The choir is also looking for sponsors to defray its Festival costs. Support in cash or kind would be very welcome and will be graciously acknowledged in the Festival programme. Festival 2017 promises to live long in the memory, and BMVC would love to see you there on Saturday 27th May. Four choirs, three nations, one concert, tickets €15. 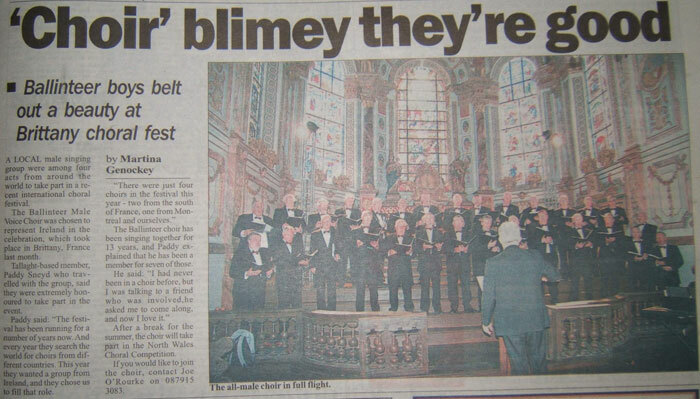 Ballinteer Male Voice Choir were one of only four participating choirs who took part in the Brittany Choral Festival.